Toyota Gazoo Racing takes its first victory of the 2016 FIA WEC season today at Fuji Speedway. 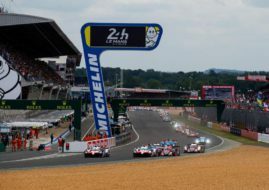 The #6 Toyota TS 050 Hybrid, driven by Kamui Kobayashi, Stephane Sarrazin and Mike Conway, crossed the finish line ahead of #8 Audi R18 and #1 Porsche 919 Hybrid. The second Toyota LMP1 prototype finished in the fourth place, ahead of #2 Porsche crew, which remained in the championship lead after eight races and with two more rounds to go. In the LMP2 class, #26 G-Drive’s Oreca 05 (Nissan) stole the victory from #43 Ligier JS P2 of RGR Sport by Morand. The drivers of the victorious car were Will Stevens, Roman Rusinov and Alex Brundle. Ford Chip Ganassi Team UK scored 1-2 victory in GTE Pro category, with #67 crossing the line 15 seconds ahead of sister #66 car. The race winners for the first time in 2016 season are Andy Priaulx and Harry Tincknell. Pedro Lamy, Paul Dalla Lana and Mathias Lauda are GTE Am class winners with #98 Aston Martin Vantage. Its is fourth win of the season for #98 crew.